This October a system of three Jet Blowers was installed in the paper mill to aerate and homogenize three process water tanks. With the aeration of the waters, a serious problem of odors has been solved associated to a potential of oxidation-reduction of the waters very negative (due to its highly closed circuit). The values of redox potential before the aeration of the tanks was -250 mV, and two days after the start-up of the Jet Blowers, the redox values were +80 mV. Other benefits obtained at short-term have been the reduction of the consumption of biocides and a better stability in the short circuit of both machines. 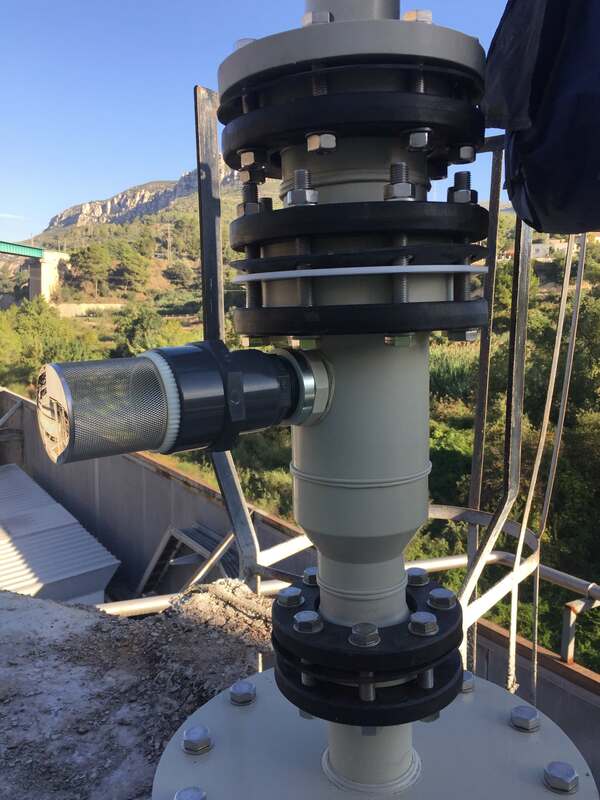 For the first time, S&S has installed Jet Blowers made of high density polypropylene, as shown in the photograph, and not of AISI 316L stainless steel.